Algeria i/ælˈdʒɪəriə/ (Arabic: الجزائر‎, al-Jazā'ir; Berber and Algerian Arabic: Dzayer or Ldzayer, French: Algérie), officially the People's Democratic Republic of Algeria (Al Jumhuriyah al Jazairiyah ad Dimuqratiyah ash Shabiyah), also formally referred to as the Democratic and Popular Republic of Algeria, is a large country in the Maghreb region of Northwest Africa with Algiers as its capital. When referring to its land area, it is the largest country in Africa and the Arab World, and also of the countries bordering the Mediterranean Sea; it is also the tenth-largest country in the world. 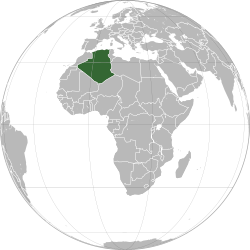 The country is bordered in the northeast by Tunisia, in the east by Libya, in the west by Morocco, in the southwest by Western Sahara, Mauritania, and Mali, in the southeast by Niger, and in the north by the Mediterranean Sea. Its size is almost 2,400,000 square kilometres (926,645 sq mi) with an estimated population of 37.1 million as of 2012. Algeria is a member of the African Union, the Arab League, OPEC and the United Nations. The country is also a founding member of the Arab Maghreb Union.